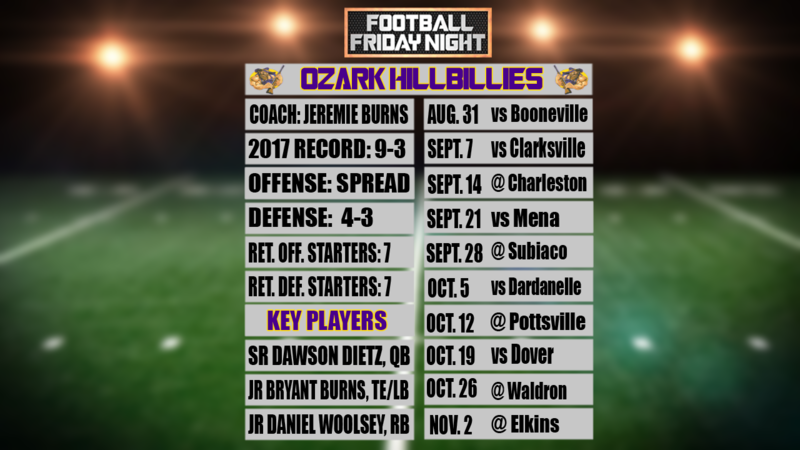 OZARK (KFSM) - If consecutive trips to the playoffs and returning 14 starters to a roster isn't enough to give a team some confidence, maybe coming into the season ranked first in the conference will do the trick. The Ozark Hillbillies enter the year with everything one could hope for in a winning team. "This year, we've got the ingredients if we can just cook it up right and get them all the way back to the Rock there," said head coach Jeremie Burns. "We got lots coming back, so we got as much potential as we did last year and hopefully we can do some more this year," added senior running back Eddie Graham. "That brings a lot of confidence. We have a lot of confidence. We've always played together. We've always been together," said senior linebacker Colt Millsap. "It's kind of like a brotherhood." All-state senior quarterback Dawson Dietz has been the signal caller for the Hillbillies the past three years. Last year, the standout passed for 1,804 yards and 16 touchdowns and ran for an additional 719 yards and six touchdowns. He joins junior running back Daniel Wooley, who packed his stat shet by running for 839 yards and 15 tocuhdowns. "Dawson's led us for three years here, and then he's got several seniors on the offensive line. Got a couple sophomores it looks like that are going to fill in for a couple other spots on the O-line," Coach Burns said. "Some of those other guys are going to be able to rest on defense and play them just one way instead of both ways like we had before. That's going to really help us that way." A lineup like this is a game of chess Coach Burns can maneuver in many different ways. "It's nice to have as many guys as we have out. Real dedicated guys, they've worked their tail off in the spring and in the summer trying to get better at each of their positions," Coach Burns said. "It's been really blessed the past few years." Even after allowing just 15.8 points per game in conference play last year, the dreaded second round once again ended Ozark's dreams. Rather than dwelling on their shortcomings, the team is full force ahead to what could be a special year for the purple and gold. "We're ready to go out there and play. All summer we've just been building up to this, we're just ready to play," Patton said. "I think we're all eager to get out there on the field and show them what we can do." With a star-studded squad and Hillbilly pride running deep, Ozark's momentum could be enough to spring them to Little Rock to fight for it all. "It's going to be very exciting this year, Millsap said. "We have a few tricks up our sleeve, so they need to be ready for it." Ozark opens their season August 31st with an away game against Booneville.